Having done some serious writing, mixed with a lot of raving and ranting on the blog for some days, I feel it is time for some harmless humour for the weekend. These two news items were printed in adjacent columns, and I read them in conjunction, even if juuuust for a nanosecond. Just to set the record straight (and to prove that there is no photoshop involved in this image), here is the complete picture. For those who are more critical and curious, this is in DNA (Pune edition) on 14th March. There is no reason for Congress to feel worried about PMK leaving. In any case, for the next few weeks, we will keep hearing these bits of news - XYZ joins AXCS, JHYF and IUY enter seat sharing agreement with TERDG. KJH(T) and KJH(R) come together again in Orissa but decide to contest separately in Nagaland, QWERTY merges with YUIOP, and so on. Everyone knows that politics (especially electoral politics) has no ethics and rules at all, but Mr. Ambumani Ramadoss has achieved a new low in this matter. So, even more amazing is that Ramadoss "does not rule out" joining UPA after the elections! Wow - that's convenient. What I don't understand is - on what basis is the voter supposed to decide? Does a party's manifesto have any sanctity at all? So if I were a voter in Ramadoss' constituency (I am not, thanks!) how would I know if he supports or opposes a policy matter, say the Indo-US nuclear deal? I am sure he will have a ready answer for the sake of TV cameras, but the real answer would be "I will decide everything only after the election results are announced. My policy will be to follow the policy of that party which is going to be in power." But why am I criticizing only him? They are all the same, under different names. The best, and amazing of course, part would come if AIADMK wins more seats in TN but also decides to join Congress to form the govt. at the center. You might think that Ramadoss would be left with egg on his face, but no. I am sure he would have no qualms in meekly following Amma's footsteps into UPA. What's more, he might even demand that he be made a minister again. After all, anything is possible in love, war and Indian politics. I have always been amazed at the state of roads in Pune, which can be only described as 'dynamic' or 'fluid'. Not a day passes when some road is not being either built or dug. Usually for a particular stretch of any road, these two actions also alternate each other with amazing rapidity. But this one probably is a new record. This road is a few hundred meters away from Suresh Kalmadi's house (just in case you have forgotten, he is the congress candidate from Pune for the next elections). It got a facelift by way of a nice flat-as-flat-can-be layer of tar only three days ago. (Or was it two?) It is so new that it is still the slate grey colour that brand new roads acquire. Good for the citizens, you might think? WAIT. Here come the diggers and start digging in right earnest. I don't know whether this is a cruel joke or a novel way of implementing the Employment Guarantee Scheme (so that both the road-builder's and road-digger's family can be happy). This is surely not the first time that I am seeing this. I once even saw one side of the road being laid with new tar and another man digging exactly the opposite side, in the same space and time coordinates. The guy digging then was unauthorised, he was digging to erect a Ganesh pandal. Of course, that didn't justify his action then. But this? 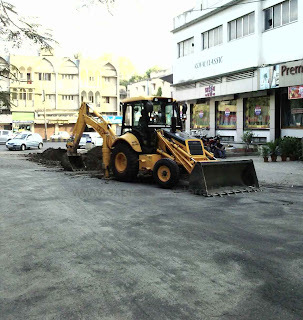 In this case, there is nothing unofficial about a huge JCB machine digging in the middle of the road. This is not funny. It is actually taxpayer's money being spent senselessly. I am sure Suresh Kalmadi is blissfully unaware of this. I wonder if there is ANYONE there who has a valid explanation for this act of stupidity? If in a hypothetical condition, the voters have to vote in the next election only on the criterion of 'quality of infrastructure (mainly roads), then Suresh Kalmadi wouldn't even manage to retain his deposit. For those more curious, this is the by-lane of Karve Road, exactly opposite Alurkar Music House. The much-awaited launch of 'people's car' by Tata is no nano feat. It is a mega achievement. Ratan Tata has set an example for many businessmen to follow, not just in India but the world over. 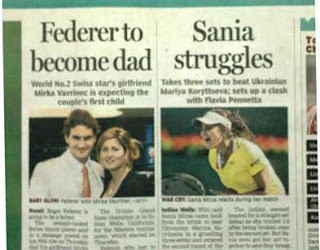 The Tatas have sufferred two setbacks in the recent past. One thanks to an internal detractor, our complaint-specialist, whining-master Mamta Banerjee and the other by external forces by way of 26/11 attacks on the Taj. In spite of all this, it is indeed commendable that Ratan Tata has stood by his words - "a promise is a promise". A lot of people still complain about the quality of Tata Motors cars, claiming that Tatas are after all 'truck builders'. I drive an Indica (and its my 2nd Indica) and am more than satisfied with it. Only time will tell what fate awaits the Nano when it finally rolls out on the roads. Will Tatas manage to start deliveries on time? Will it add to the traffic snarls and parking woes manyfold? Whatever happens, Ratan Tata has written a new chapter in the corporate history of India. All this, at a time when the world is reeling under recession! 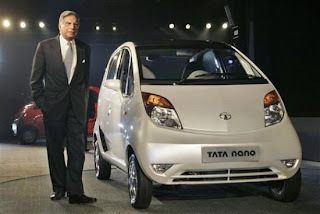 The Nano has been a dream project for Tatas and is sure to be the dream for millions of people in India. Why not? If a slumdog can become a millionaire, why should it stop my vegetable vendor from wanting a Nano? Its been over a week since I saw Anuraag Kashyap's Gulaal, and yet its images refuse to leave me. But before I go into my thoughts about it, a little digression. I have not been into college politics, (mainly because I hardly attended college, but that's a different matter) but knew enough to keep away from it. Interestingly, I did get embroiled in one of the college annual elections. I was the class representative for PG that year. Now there was the annual election of University Rep which involved only eight votes to be cast, four each from science and arts streams. Year after year, only that candidate would win who managed to get a voter from the 'opposition' to defect. One fine day four guys came up to me and said they wanted to speak to me as I was the PG Science rep. They gave me a passionate speech about how it was important for 'our' science candidate to become the Univ. Rep. Of course I agreed (no doubt science guy should be the rep. How dare the arts guys send their rep? I said) Having given my unconditional support I thought I had done my job, now all I had to do was go and vote on the designated date. But I was wrong. On the D-day, some eight guys came home at 7.30 in morning, even when voting was at 11 am. I assured them that I would reach college in time for voting and that they need not bother at all. They politely declined and offered to wait outside for the next three hours. That was ridiculous. So I got ready soon and was all ready to mount my moped when they politely intervened again. "No no, sir. Not on your moped. We have a vehicle." I was then honourably bundled into the rear seat of a Tata Sumo and taken somewhere. (To 'an undisclosed location' - is how today's news channels would have described it, if they were tracking the story of an unwilling college politician.) So there we were, the four precious voters kept in a room, being served tea and wada-pav. (No there wasn't anything else, it stopped at tea and wada-pav!) At 10.30, our convoy (yes, by now there were others jeeps surrounding our Sumo) reached the college and the four of us were safely escorted into the building as supporters waited outside with gulaal and drums. Of course, Science won (5-3) as one of the arts guys was the cousin of our candidate. There was much frenzied gulaal-throwing and drum-beating for a couple of hours thereafter. Only later in the day did I wake up to the fact that I had spent the better part of morning in a kidnapped state. Of course, my kidnappers had done so only with the noble intention of avoiding me being kidnapped by the opposition. Science rules, OK. So that's how my flirting with college and Gulaal days ended even before I could do anything spectacular. That day in the movie hall, Anuraag Kashyap's Gulaal initially brought back the funny memories. But soon, the movie stopped being funny and I sat up straight. Gulaal has that ablity - to grab you by the collar and shake you out of any self-imposed popcorn complacency that you may have got yourselves into. I am not going to give the story here. There are enough and more reviews on the net for that. To start with, one of the biggest shares of the credit should go to Piyush Mishra. His lyrics and music are an integral part of the movie. No unnecessary song and dance sequences, just stark, straight in-your-face lyrics that actually are a part of the narrative than being distractions or tension-relievers, as many Hindi movie songs are. The lyrics of 'Ranaaji mhaare' may seem absurdly comic if seen in isolation. But put them in perspective of Prithvi Bana's character and the situation in the movie, they could not have been better. It is a classic. जैसे दूर देस के टावर में घुस जाये रे एरोप्लेन ! For one, today's folk tunes are coming out of traditional lyrics and making hybrid songs. One can hear strange lyrics in Ganpati aratis being belted out in many Ganeshotsav pandals every year. But more than that, Prithvi Bana is an antithesis of his more aggressive brother Dukey Bana (Kay Kay Menon). If Dukey's burning ambition is to rise to authority and power, Prithvi defies authority with his sarcastic and cynical wit. No wonder he wears a John Lennon locket and his lyrics talk about aeroplanes hitting powers. Sorry, towers. फिर तो तू जितने गुलाल वाले हैं, सब को पहचानता होगा? फिर गुलाल लगाने का फायदा ही क्या हुआ? This one line summarizes his pointedly cynical view of the futility of revolutions based on a flimsy and failed ideology. The movie has some crazy moments. To me, they are masterstrokes. I saw Mahi Gill in Dev.D just a couple of weeks before Gulaal and and kept saying to myself, "there's something about Tabbu in her." And here in Gulaal, a passionate and distraught Madhuri (a mujra dancer played by Mahi) asks our confused hero, "don't I look like Tabbu? Then why doesn't he love me?" Then there's this old ageless flute player, sporting a long flowing white beard. He is just there. He doesn't really do anything, other than playing flute all by himself and for himself. But then in one sequence, Anuja (an angry, frustrated but self-respecting college teacher played by Jesse Randhawa) is giving her piece of mind to the hero while nonchalantly combing the flute player's beard. She and the old man, both are social misfits, choosing to be in an self-imposed psychological exile. Even in our most solitary exiled corners, all of us need other people. (reminds me of how Willliam Schutz's 8-year old daughter summarized her dad's years of research by simply saying - "Dad, people need people." Anuraag Kashyap has the knack of telling many stories in one shot, where many of his sequences are multi-layered. His No Smoking was a little too multi-layered, though! I don't know if I was imagining, or whether it was the effect of watching Dev.D and Gulaal within a fortnight of each other, but there seemed to be an uncanny similarity in the two protagonists. Dreamy young man turning into a crazed psychotic, two women in his life. The excessive use of red colour and psychedelic designs of the two rooms. But then it stops there. Dev is an idiot, period. You don't even feel sorry for him. You only wish that someone gives him one tight slap and brings him back to reality. But Dileep Singh (played by Raja Chaudhary) is not like that. As he descended into the well where he knew the arms are stored, I wanted to scream out to him, "NO, DON'T! THAT'S NOT YOUR PATH. GO BACK, GET ON WITH LIFE, DAMN IT." Is it a depressing movie? By all means yes. It is a totally post-modernist view of Indian way of divisive politics, caste rivalry, greed, brute power, using other people as per convenience, lust, and much more. I suppose it provides us with a counterpoint for balance. The Johars and Chopras (and Ekta Kapoor, how can I forget her) regularly take us into they-lived-happily-ever-after lands of bliss. Before we can lose our way into this utopia, Anuraag Kashyap stuns us out of our revelry. I am not saying that only Gulaal depicts today's reality. There are a lot of good things happening in life all around us, but they are only one side of the coin. Dev eventually listens to Chanda who drags him back to normalcy. Dileep doesn't listen to Anuja. Two sides of a coin. Take your pick. Some trivia - a lot of reviews describe the movie as 'based in modern-day Rajasthan'. Has nobody noticed that there are no cellphones in the movie? And finally a word about the title of this post. So far anyone wanting to depict corrupt gun-based politicians would turn towards Bihar, as if all other states have clean politics. Gulaal may be based in Rajasthan, but it could happen anywhere - Patna, Porbandar or Pune. Why not? After all, I was kidnapped once in Pune! There is another phenomenon here. For years, cricket was a sport like any other - say hockey or basketball or kabaddi, for that matter. Then with the advent of ODI and then T20, it became a spectator event. Now IPL with its much publicized franchisees, celebrity owners, player auctions and of course the gyrating cheerleaders, it has now become a TV show. What matters more here is TRP ratings, advertising revenues and the money that everybody makes in the bargain. The decision to move IPL out of India only reinforces this point. Slumdog kids walk the ramp - can we stop this nonsense please? Now the two little kids from Slumdog walked the ramp today. What's going on? There is this highly irritating show going on NDTV just now and and an even more irritating lady (Leena Singh) gushing forth about how she put them up in a 5-star hotel, how she took them to the swimming pool, and other equally idiotic stuff. The amount of money being spent in this completely meaningless exercise could be spent on other worthwhile causes. Say, building toilets for the school in Dharavi, where these children hail from. I am also sure that if you ask the kids, they will agree to this. But who really cares for what they want? Come on Leena Singh, they are KIDS. You give them a chocolate, they will eat. But remember that you are making them do it so that YOU can be on TV. Not because you want the to enjoy chocolate. I fear what's gong to happen to these kids when they grow a little bigger and stop being cash cows for armchair social activists. There was this other lady (I missed getting her name, sorry lady) who went blue in her breath trying to assert that "its not about these two kids. Its about millions of kids like them. " I agree with you Ms. But unfortunately the world, read TV anchor, wasn't listening to you. She was more interested in getting unnecessary details about the ramp walk. The latest attack on Sri Lankan team in Lahore comes close on the heels of the terror attack on Mumbai. Theories are flying thick and fast on whether this attack was originally intended for the Indian team which was supposed to be touring Pakistan at that very moment, on whether this will permanently affect cricket matches in the subcontinent, on whether the 2011 world cup matches can be staged as planned, and so on. Whats more - firing continues for about 30 minutes, leading to the death of Pak police ostensibly providing security for the bus. AND NOT A SINGLE TERRORIST IS EITHER CAPTURED OR KILLED. All this, when the TV channels are showing the terrorists freely running around as if they are wandering in a park. So picture this - the security personnel are INSIDE the vehicle and are armed, I hope (so the vehicle actually provides them cover) and the terrorists are OUTSIDE in the open. And yet they manage to do what they intended to do and actually disappear from the scene. I don't intend to say that the security personnel who died were ineffective. If they died doing their duty, it cant be for nothing. But how is it that in broad daylight, NOT A SINGLE terrorist got captured or killed? Even as I type this post, NDTV is airing CCTV coverage showing terrorists calmly walking through the streets and some happily driving away on mobikes. I find this completely mysterious. And then - even if you don't want to believe that Pakistan governance is not hand-in-glove with the terrorist elements, such events make you doubt your self. The press is going berserk and proclaiming that 'now even cricketers are not safe'. But then in the kind of times that we live in, who IS safe? Just check out the movies which got nominated for Best Film - Dostana, Ghajini, Jodha Akbar, Rab Ne Bana Di Jodi, Jaane Tu Ya Jaane Na and Rock On. What is the criteria for getting nominated? Even if you consider for a moment that success at box office is the main criteria because movies are after all held up or thrown to the dustbin by movie-goers. Even then, it makes no sense at all. I just saw 'The Big Fight' on NDTV about "Should India Really Be Celebrating Slumdog Oscars?". The panelists were Sudhir Mishra, Nafisa Ali, Simon Denyer (Reuters India), Arindam Chaudhary and Jug Suraiya. Now, I failed to understand exactly what was Arindam doing there? OK, he has has produced a handful of movies - which does NOT in any way mean that he understands movies. He went to prove that in the show clearly - thankyou Mr. Chaudhary. Thankyou for finally telling us how little you know about India and its people and what movies mean to Indians. 1. A sikh born in pre-partition Punjab writes a song. 2. A practicing sufi muslim based in Chennai composes the music. 3. Another sikh born in Amritsar sings the song. 4. A muslim born in a little village in Kerala engineers and mixes the sound. 5. It features a boy born in UK to Gujarati parents (who were born in Kenya!) and a Christian girl educated in Mumbai (and scores of other budding dancers. 6. And finally the song is picturized in one of our country's best-known landmarks. This song goes on the win an Academy Award. Now, show me a better example of what Indians can do when we come together and then dare ask the question - should Indians be celebrating Slumdog Oscars? 1. "I think it is a very negative feel-good film." Now, what does he exactly mean by that? How can anything that is feel-good be negative or positive? A. He never travels anywhere in India by road. B. He never really bothers to look out of the window of the car when traveling. C. He does not actually know what a blind beggar looks like. This is not a question from Who Wants to Be a Millionaire, because it is too simple. But please post your answers nevertheless. It will at least stop TV channels from calling him henceforth.